A U.S. Muslim rights group will hold news conferences in the Middle East in a bid to secure the release of an American journalist facing death by her captors in Iraq…The Council on American-Islamic Relations will hold the first conference in the Jordanian capital, Amman, and the second Friday in Baghdad.The Washington-based group says it wants to reach Arab audiences to convince the kidnappers of Jill Carroll to release her.”We’re taking a serious step on behalf of our community, and we are hopeful that our words will be heard and our appeal will be listened to,” said Nihad Awad, executive director of CAIR. “We have been reading about her work … and though we don’t know her, we know it is wrong to kidnap people and hurt innocent people.”Carroll, 28, is a freelance reporter for the Christian Science Monitor newspaper. She was on her way to meet Sunni Arab politician Adnan Dulaimi in Baghdad’s western Adel district when she was kidnapped on January 7. The kidnappers shot dead her Iraqi interpreter, Allan Enwiyah.Her kidnappers threatened to kill her on Friday unless all Iraqi female detainees are released. A U.S. army spokeswoman, Sgt. 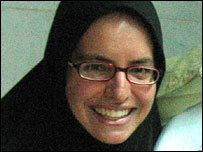 Stacy Simon, claimed that the U.S. only holds eight Iraqi women. She didn’t provide further details.White House spokesman Scott McClellan said Wednesday that Carroll’s “safe return is a priority” but noted that he won’t talk about the issue because of the sensitivity of the situation.CAIR, the U.S.’s largest Muslim advocacy group, has 31 offices and chapters throughout the U.S. and Canada.Its mission is to improve the understanding of Islam, encourage dialogue, protect civil rights, help American Muslims, and build coalitions that promote justice and mutual understanding.